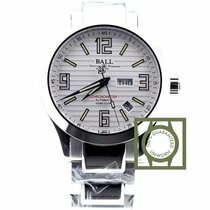 Ball Engineer II Arabic Chronometer NM2026C-S2CA-BK men's watch. Features a polished stainless steel case and brushed with polished stainless steel bracelet. Polished stainless steel bezel. Black dial with index and Arabic numeral hour markers. Date displayed in window between 4 and 5 o'clock. Day of the week displayed in window at 3 o'clock. Powered by the Ball Caliber RR1102-C self-winding automatic COSC Chronometer certified movement which boasts a 38 hour power reserve and beats at 28,800 vph. A scratch resistant sapphire crystal protects the dial. The case is round, 40mm in diameter and 13.2mm thick. Inlet size: 20mm. Screw down crown. Stainless steel deployment buckle. Water resistant to 100 meters / 330 feet. Functions: hours, minutes, seconds, day, date. Casual watch style. Swiss made.